Traditionally the notion material culture involves a total combination of objects made by man to satisfy vital needs of a particular society. Since material culture is a mechanism for adaptation of a society to fit specific natural and social conditions, it actually represents nearly all aspects of life of an ancient ethnic group. These are natural environment, level of socio-economic and political development, surrounding and relations with neighboring ethnic groups. Two sources are available for studying the material culture of Scythians – written and archaeological ones. They complement each other nicely. While the former mainly addresses the early period of Scythian history, the latter gives an accurate account of the period of state formation and prosperity. Scythians had no written language, there are no records available. Books of Ancient Greek authors are the only source of obtaining information. And nine volume “History” by Herodotus is the most conceptual one. He visited the Northern Black Sea Area in the fifth century B.C. and provided us with fairly accurate and detailed picture of Scythian life, traditions and customs. So Scythians (as Ancient Greeks called them) are Persian-speaking nomads. Their state was formed on the principles of expansionist war policy and exploitation of the enslaved tribes and nations. Nomadic cattle-breeding was their main activity, the basis of their economy. That influenced all aspects of their life as mobile belligerent horsemen and primarily their houses. According to Herodotus (IV, 46, 127) Scythians did not build towns and fortresses, cart was their house. It made Scythians invincible to their enemies. In case of a halt or external menace they arranged their carts in a circle making a kind of fortress camp. Nomads lived in felt tents set up on carts; those were four- or six-wheeled vehicles. They were arranged like houses and had two or three compartments. Felt cover provided strong protection from wind, rain and light. Such wheeled houses were commonly drawn by two or three pairs of oxen. 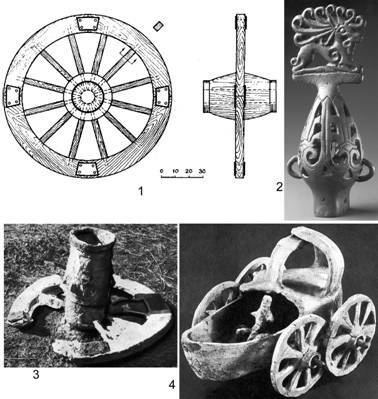 Remains of disintegrated carts can be found in some graves of Scythian aristocracy. Wheels had wooden hubs and spokes and also iron tires (Fig.1, 1,3-4). Rectangular bodies made of planks had low sides with multicolored painting. The upper part (felt cover) has never been preserved unlike metal decorations – bronze plates of various shapes on cover as well as bronze poletops (Fig.1, 2) at the corners and in the center ( Бессонова , 1981; Мелюкова , 1981; Болтрик , 1997; 1998; Болтрик , Савовский , 1991) . Since Scythians had no settlements, burials are the only comprehensive archaeological sources. It mainly concerns those of aristocracy as they are the reserves of most characteristic and unique samples of material culture. We recognize Scythian material culture by the so called triad - arms, bridle and animal-style works of art - peculiar to that very ethnic group. Arms and armor . Life and social organization of Scythians, especially early in their development, were fully determined by war. According to Herodotus, Scythia is a state where everyone is a mounted archer (IV, 46), that is a warrior. Due to permanent involvement in wars, particularly raids to Asia Scythians enriched their military experience and created their own weaponry. Bow and arrows were commonly used for attack. Arrowheads were found almost in every grave (their number varied from few pieces to several hundreds). At that time, arrowheads were mainly cast in bronze. But iron, bone and wooden ones of various shapes and sizes also existed (Fig.2, 2). Those made of bone and wood were used for hunting while metal ones for fighting. Wood staffs 45-84 cm long were sometimes color-striped. Rather small (only 60-70 cm) bow was made of wood, bone and tendons. Since the bow is rarely found its shape could be inferred only by pictures on works of art. (Fig.2, 3). A special sheath of wood and leather - a quiver - was used to keep and carry bow and arrows. Scythian aristocracy commonly used gorytos - sheathes decorated with gold plates ( Черненко , 1981) . 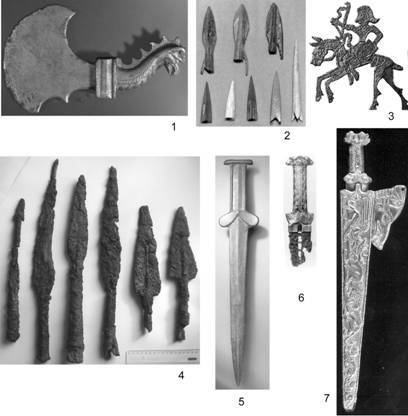 Spears and javelins were rather popular (Fig.2, 4) . Short ones (up to 2 m long) were used for close combat and throwing, while long ones (up to 3 m long) were used for mounted battle ( Мелюкова , 1964) . Swords and daggers, the so called acinaces, were of vital importance to Scyths. Their length averaged 50-60 cm, the longer ones up to 1 m, the majority of them being double bladed ( Черненко , 2002) . 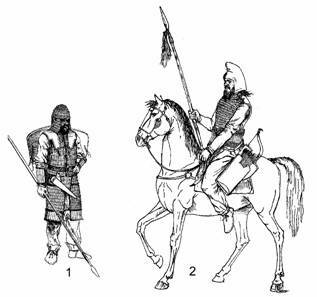 Throughout Scythian period only shapes of sword pomme and guard have undergone changes ( Fig.2, 5-7 ). Scabbard for carrying sword was made of wood and leather often with gold decoration. Scyths were also armed with battle-axes (Fig.2, 1), maces and hammers. Protective equipment of Scythians. Its basic piece was a leather shirt with small metal (iron or bronze) plates sewn on fabric like fish scales. Brigandine might be long or short, sleeved or sleeveless. It was light and did not hamper easy movement, it provided a warrior strong protection . Sometimes brigandine was supplemented with shoulder straps . Belt was an integral part of the armor; it consisted of metal scales and served the dual function of protecting and fastening nearly all arms, whetstone, whip and cup . To protect head they used helmet. At first, it was cast ( Cuban type ), later a lighter forged Greek type appeared and since 5 century B.C. iron-scale helmet came into common use . C uisses and greaves served for lateral and front leg protection, they covered side and front parts (leaving back parts uncovered as scales could hamper riding). In the fifth century B.C., much more lightweight and effective Greek type greaves appeared to protect shins . Shields were good protection means. Made of wood and leather, they differed in shape, had solid or scaled covering and were often decorated with ornamental plates ( Черненко , 1968; 2002) . Full range of protective equipment rarely occurs (Fig.3, 1-2 ). One was found in a grave near village Gladkovshina ( Cherkasy Region ). It took 3233 iron plates-scales to produce full equipment and its weight totaled 25 kg ( Григорьев , 1994; Мінжулін, 1991 ) . Women so-called Amazons constituted the major portion of all warriors. Virtually all ancient authors mentioned them in their books on the Northern Black Sea Area . I would like to cite some of them (Pomponi Mela ( I , 19 (114), Hippocrates (24) and Philostrates) . Amazons were skilled horsewomen, served in the army , took part in mounted attacks . Bows, arrows, spears, javelins, axes and lassos were their weapons. Their protective equipment was just a small light shield (cavalry shield) . According to archaeological evidence – every fourth grave with arms was that of woman . Thus women formed 25% of Scythian army . They had no pieces of protective equipment . It suggests that they were not involved in infantry actions ( Фиалко , 1991; 2005) . Throughout Scythian history, cavalry dominated over infantry. Hence vital importance of horse for Scyths. Horses were commonly buried with ceremonial harness, riding horses with saddles on, most often with bridle. But the latter was not preserved except for metal elements – iron bits and bronze cheek-pieces ( Fig.4, 1 ) . In the course of time they underwent transformations became more intricate. Often bridles were decorated with bronze, since the fourth century those were mostly gold ones (Fig.4, 2-4 ) ( Болтрик , Фиалко , 2005) . As to household goods, primitive hand-made pottery – pots and bowls were the most common ( Fig.5, 8 ). Bronze cauldrons and wooden bowls can be assigned to Scythian ware proper. 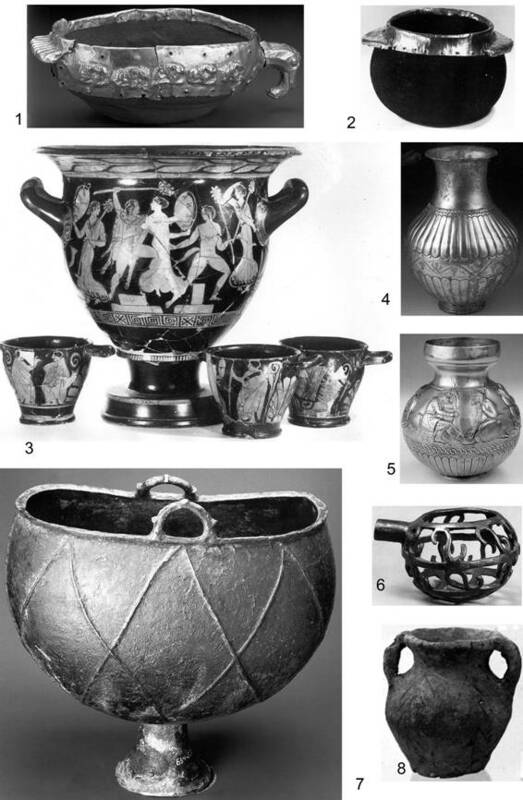 Bronze cauldrons (Fig.5, 7 ) are uncommon, they differ in size ( Степи …, 1989) and mark tombs of military elite . Only men could have wooden bowls with gold appliqué (Fig.5, 1-2 ) . They were attached to the belts , used as common ware and proved their courage. A warrior had to kill some enemies and show personal heroism to be awarded with such a bowl ( Фиалко , 2004). Since the fifth century B.C. Greek black-glaze pottery came into use. Those were mainly different in shape cups for drinking, bowls and quite rare vessels for cosmetics . Large kraters (Fig.5, 3 ) for mixing wine and water were found only in two graves – they marked nomarch graves ( Фиалко , 2004- а ) . Metal (bronze, silver and gold) Greek ware, such as kylixes, vases (Fig.5, 4-5 ) and drinking horns, have found wide application. Rich graves contained set of metal ware – basin, jugs, sieves and vases ( Фиалко , 1996) . Wine was brought and kept in amphoras. For women the most typical implements were bone spindles and metal needles ; of toilet articles – mirrors , combs (Fig.6, 5-6 ), boxes for jewels; of jewelry - glass beads or metal necklaces, ear-rings , bracelets, rings (Fig.6, 1-4 ). Men also used jewelry – more often pendants and rings, rarely bracelets and ear-rings ( Степи …, 1989; Кузнецова , 2002; Фиалко , 1999) . 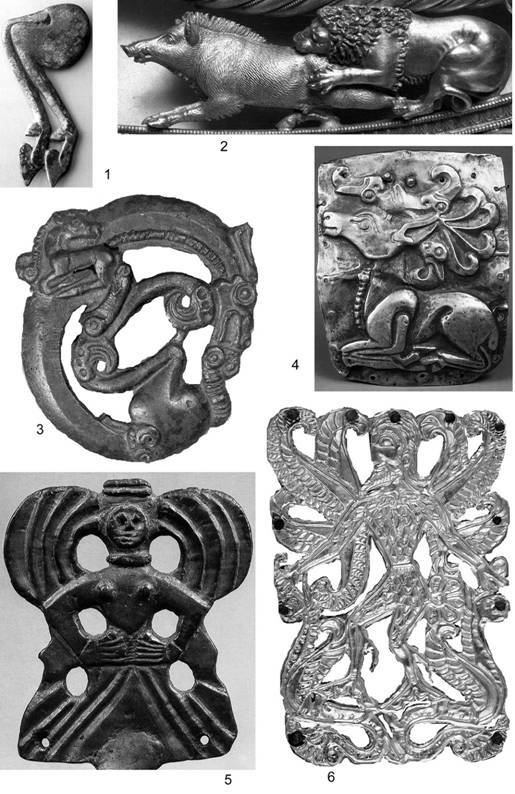 І. Geometric style – was mainly used to decorate ware (Fig.5, 6-7 ) and not so often dress, ritual poletops and bridles. That style was characteristic of earlier period ( Фиалко , 2002) . ІІ. Animal style – is unique. Features peculiar to this style are: 1) method ofmodeling object surface (Fig.7, 3 ) ; 2) method of accentuating features (Fig.7, 1 ) ; 3) method of zoomorphic transformations (Fig.7, 4 ). Commonly Scythians made pictures of deer, elk, gout, wild boar, panther, lynx, lion, eagle and griffin . As a rule those were pictures of single animals. At the end of the fifth century B.C., attack scenes appeared (Fig.7, 2 ). Main functions of these pictures are to protect their owners . 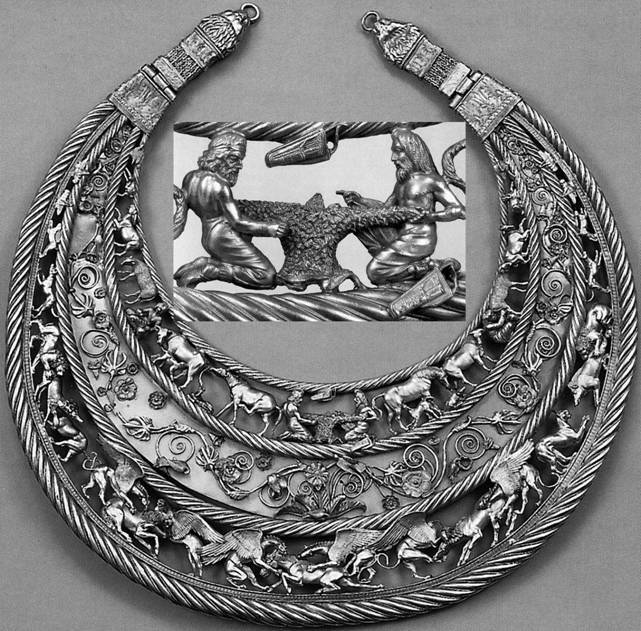 This style was characteristic throughout Scythian period ( Переводчикова , 1994) . ІІІ. Antropomorphic style – is connected with pictures of heroes and Gods (Fig.7, 5-6 ). It is characteristic of : 1. sketchiness ; 2. low artistic level ; 3. combination with animal pictures . It appeared at the end of the fifth century B.C. ( Бессонова , 1983). Of a special interest are stonestela. Some of them bear portrait features (wide or long face, moustache, beard) and sharp image of different objects (arms, bowls, drinking horns , belts), other give only a silhouette without details ( Ольховский , Евдокимов , 1994; Белозор , 2002) . These stela are interpreted quite differently as an image of God , king, heroized deceased Scythian or heroized forerunner of Scythians. Works of ancient art give us an idea of Scythian appearance and clothes (Fig.8, 1-3 ) . Only once we restored dress based on archaeological materials from Vishneva Mogyla. Girl’s dress consisted of: 1 . long white shirt; 2 . dark-red skirt; 3 . black vest with fur trimming; 4 . red leather shoes; 5 . colored glass beads ( Прилипко , Болтрик , 1991) . Women wore long shirt-like dress with belt and long-sleeved fur-trimmed overcoat. They had leather shoes with gold ornaments. Women wore various hats supplemented with shawl. Men wore long belted jackets, sometimes with fur trimming, wide trousers and short soft-leather boots. Head was mostly covered with bashlyk. All clothes were decorated with different gold plates ( Клочко , 1984 ; 1991; Фиалко , 2001) . As for hair style – men had long hair sometimes with cropped forelock. Most of them had beard and moustache. With respect to women we know little from few pictures on sewn gold plates – young girls and women plated their hair, while married and elder women covered their hair with head-dress ( Rolle , 1991) . And now a few words about works of Ancient Greek art from the Scythian monuments. Those unique things were created by Greeks with regard for tastes of Scythians either as presents or for sale. Buried with the deceased those works hardly escaped looting and destruction. Artistic values of artifacts prevail over their worth in the weight of precious metals. The well known gold pectoral from Tovsta Mogyla weighs 1 . 125 kg ( Мозолевский , 1979) . 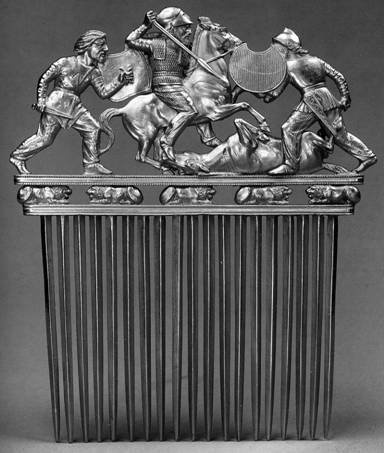 I’ll mention most popular works of Ancient Greek art from the Scythian monuments. There are: Gold pectoral from Tovsta Mogyla – chest decoration (Fig.9 ) and series of Gold cupsfrom Hajmanova Mogyla , Kul - Oba , Chastyy barrow with scenes of everyday life; Gold torque from barrow Kul - Oba , with ends decorated with Scythian horsemen ( Мозолевський , 1983) ; Silver amphorae from Chertomlyk with scenes of horse taming ( Алексеев , Мурзин , Ролле , 1991) ; Gold comb from Solokha (Fig.10 ) ( Манцевич , 1987) and Gold cone-shaped object from barrow Perederiyiva Mogyla ( Моруженко, 1992 ) with combat scenes; Gold cone-shaped object fromBratolyubovskiy barrow (Kubyšev, 1996) with horse heads. Besides unique artifacts series of Gold gorytos (from Chortomlyk, Melitopolkiy, Illinetskiy and Yelizavetovskiy barrows) with scenes from Achilles life is also known. Besides so called Gold microsculpturefrom Oguz should be mentioned – small three-dimensional details of composite ornaments (Fig.6, 2 ) ( Boltrik, Fialko, 1996) . Due attention should be given to numerous Gold plates for dress decoration. All these works marked belonging their owners to the definite level of social structure ( Фиалко , 1999- а ) . Геродот. История в девяти книгах. Перевод и примечания Г.А. Стратановского. Ленинград, 1972. Скифы. Хрестоматия. Составление, вступительная статья, комментарии Т.М.Кузнецовой. Москва, 1992. Алексеев А.Ю., Мурзин В.Ю., Ролле Р.А. Чертомлык. Скифский царский курган 4 в. до н.э. Киев, 1991. Белозор В.П. Скифское монументальное искусство// Великая Скифия. Киев-Запорожье, 2002, с.139-147. Бессонова С.С. О скифских повозках// Древности степной Скифии. Киев, 1981, с.102-116. Болтрик Ю.В. Бронзовые навершия скифских повозок//Чобручский археологический комплекс и вопросы взаимовлияния античной и варварской культур (4 в. до н.э. - 4 в. н.э.). Тирасполь, 1997, с.63-65. Болтрик Ю.В. Про призначення скіфських бронзових навершь 4 ст. до Р.Х.// Музейні читання. Київ, 1998, с.146-150. Болтрик Ю.В., Савовский И.П. Курган Плоская Могила // Курганы степной скифии. Киев, 1991, с. 98-107. Болтрик Ю.В., Фиалко Е.Е. Роль коня в погребальной традиции скифов// Актуальные проблемы археологии, истории и культуры (к юбилею профессора Т.Н.Троицкой). Сборник научных трудов. Т.2. Новосибирск, 2005, с.13-36. Григорьев В.П. Захоронение тяжеловооруженного скифского воина у с. Гладковщина// Древности скифов. Киев, 1994, с.63-79. Клочко Л.С. Верхній плечовий одяг скіфів// Археологія № 47, 1984 , с.57-68. Клочко Л.С. Скіфський костюм// Золоту степу. Археологія України. Київ-Шлезвіг, 1991, с.105-111. Кузнецова Т.М. Зеркала Скифии 6-3 века до н.э. Москва, 2002. Манцевич А.П. Курган Солоха (публикация одной коллекции). Ленинград, 1987. Мелюкова А.И. Вооружение скифов. Свод археологических источников. Вып. Д1-4. Москва, 1964. Мелюкова А.И. Краснокутский курган. Москва, 1981. Мінжулін О.І. Реконструкція захисного озброєння скіфського воїна з поховання 5 ст. до н.е. біля с. Гладківщина// Золоту степу. Археологія України. Київ-Шлезвіг, 1991. с.137-142. Мозолевський Б.М. Товстак Могила. Киев, 1979. Мозолевський Б.М Скіфський степ. Київ, 1983. Моруженко А.О. Скіфський курган Передерієва Могила// Археологія № 4, 1992, с.61-64. Ольховский В.С., Евдокимов Г.Л. Скифские изваяния 7-3 вв. до н.э. Москва, 1994. Переводчикова Е.В. Язык звериных образов. Очерки искусства евразийских степей скифской эпохи. Москва, 1994. Прилипко Я.П., Болтрик Ю.В. Опыт реконструкции скифского костюма на материалах погребения скифов из Вишневой могилы// курганы степной Скифии. Киев, 1991, с.18-33. Степи европейской части СССР в скифо-сарматское время// Археология СССР в 20 томах. Москва, 1989. Фиалко Е.Е Погребения женщин с оружием у скифов// Курганы Степной Скифии. Киев, 1991, с.4-18. Фиалко Е.Е. Наборы античной металлической посуды из скифских погребений// Мир Ольвии. Памятник исследователю и исследование памятника.Киев, 1996. с.188-190. Фиалко Е.Е. Костяные гребни из скифских памятников// Проблемы скифо-сарматской археологии Северного Причерноморья. Запорожье, 1999, с.254-259. Фиалко Е.Е. Знаковость вещи в погребальной практике скифов// Скифы Северного Причерноморья в 7-4 вв. до н.э. Москва, 1999-а, с.138-140. Фиалко Е.Е. По поводу реконструкции головного убора из Рыжановского кургана// Российская археология № 4, 2001, с.144-152. Фиалко Е.Е. Искусство народов Скифии// Великая Скифия. Киев, 2002, с.127-139. Фиалко Е.Е. Округлодонные деревянные чаши в знаковой системе скифов// Вторая Международная конференция «Скифы и сарматы в 8-3 вв. до н.э.», посвященная памяти Б.Н. Гракова. Тезисы докладов. Ростов-на-Дону, 2004, с.72-74. Фиалко Е.Е. Аттический кратер как символ скифского номарха// KIMMEROWIE SCYTOWIE SARMACI . Kci ę ga po ś wi ę cona pami ę ci profesora Tadeusza Sulimirskiego . Krak у w , 2004-а, p .149-160. Фиалко Е.Е. Скифские амазонки по письменным и археологическим источникам// Боспорский феномен. Проблема соотношения письменных и археологических источников. СПб., 2005, с.242-247. Черненко Е.В. Скифский доспех. Киев, 1968. Черненко Е.В. Скифские лучники. Киев, 1981. Черненко Е.В. Военное дело скифов// Великая Скифия. Киев-Запорожье, 2002, с.76-86. Boltrik Ju . V ., Fialko E . E . Der Oguz - Kurgan . Die Grabanlage Eines Skythenkönigs Der Zeit Nach Ateas// Hamburger Beiträge Zur Archäologie. 18, 1991/ Mainz, 1996, p.107-129. Kubyšev A.I. Der Bratoljubovka-Kurgan. Die Grabanlage Eines Skythischen nomarchen?// Hamburger Beiträge Zur Archäologie. 18, 1991/ Mainz, 1996, p.131-140. Rolle R. Haar- und Barttracht der Skythen// Золоту степу. Археологія України. Київ - Шлезвіг, 1991. с.115-126. Fig. 1. Carts: details of carts – wheels (1, 3) and poletop (2); clay model (4). Fig. 2. Offensive arms: battle-axe (1); arrows (2) , picture of bow and gorytos on work of art (3); s pears and javelins (4); swords and daggers (5-7). Fig. 3. Reconstruction of full armor (by D. Shevchuk): 1 – kurgan near village Gladkovshina; 2 - kurgan near village Schuchinka. Fig. 4. 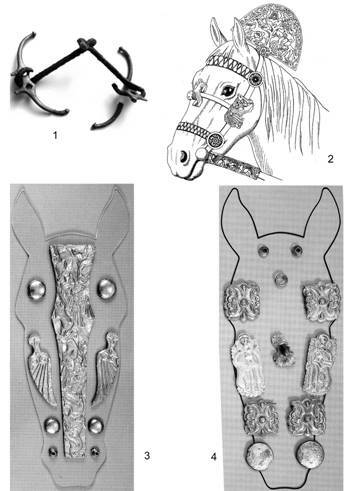 Horse bridle: bits and cheek-pieces (1); ornaments of bridles (3-4); reconstruction of bridle from kurgan near village Gjunivka (by Ju. Boltrik) (2). Fig. 5. Ware: wooden bowls (1-2); black-glaze pottery (3); foreign metal ware (4-5); bronze ladle (6) and cauldron (7); hand-made pottery (8). Fig. 6. 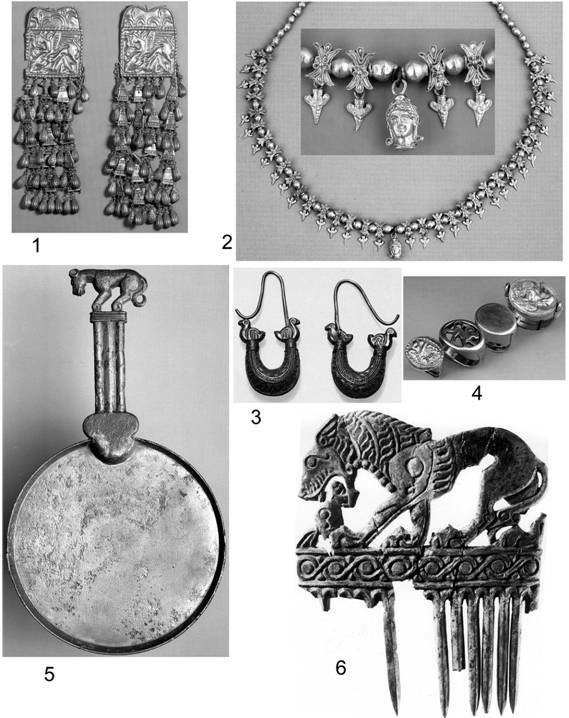 Toilet articles: mirror (5) and comb (6); adornments: ear-rings (3) , metal necklace (2), rings (4). Fig. 7. Decorative art: animal style (1-4); anthropomorphic style (5-6). Fig. 8. Scythian appearance and clothes from works of ancient art. Fig. 9. Gold pectoral from Tovsta Mogyla. Fig. 10. Gold comb from Solokha.